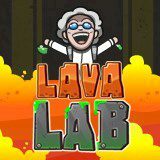 Your lab has been destroyed and lava comes from the hole. You need to reach the elevator. Is there anything you would like to know about lava? Well, you should not contact with this element and better to get higher. Climb the walls and avoid touching it!